Ya Jagoff!!! | Fred Sanford's Ghost Driving in the Fast Lane? Home Uncategorized Fred Sanford’s Ghost Driving in the Fast Lane? What do they call those bands that cover all of one band’s songs? I think they call them “Tribute” bands whether the group is good enough to pay tribute to the original band or not. 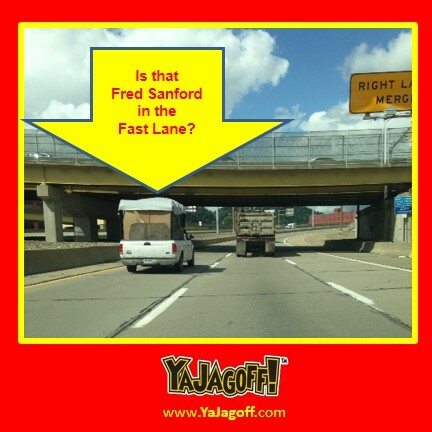 Well, we caught the Fred Sandford “Tribute Truck” full of stuff driving on Route 65…..in the passing lane…. and not wanting to pass, or even come close, to the truck in the slow lane. Just cruising along. Maybe in couldn’t go any faster or, quite frankly, maybe it needed the junk heap itself but noooooooooooooooooo, there it is not letting anyone get around him and not giving enough room to go in front of him! Freddy, Freddy, FRED-eeeeeeeeeeeeeeeee… what are ya doing??? Please take your bedframe-mattress-carrying-scrap-metal-scrap-wood-scrap-drywall-and-probably-a-month-old-open-package-of-Twizzlers-baking-in-the-sun-on-the-frunt-seat-duct-taped-fender truck and putt-putt-putt in the slow lane!! Some of us have to get home BEFORE you get to the neighborhood so that we can get our junk to the curb before YOU start riding through the neighborhood, Ya Jagoff!! !